SIOUX CITY, IOWA — A three-goal third period proved the difference in the Chicago Steel’s 5-3 win Saturday night over the Sioux City Musketeers at Tyson Events Center. Chicago (26-14-1-0, 53 pts.) tied the game early in the third before the game winner halfway through the period gave the team its first and only lead of the night against Sioux City (19-14-5-2, 45 pts.). 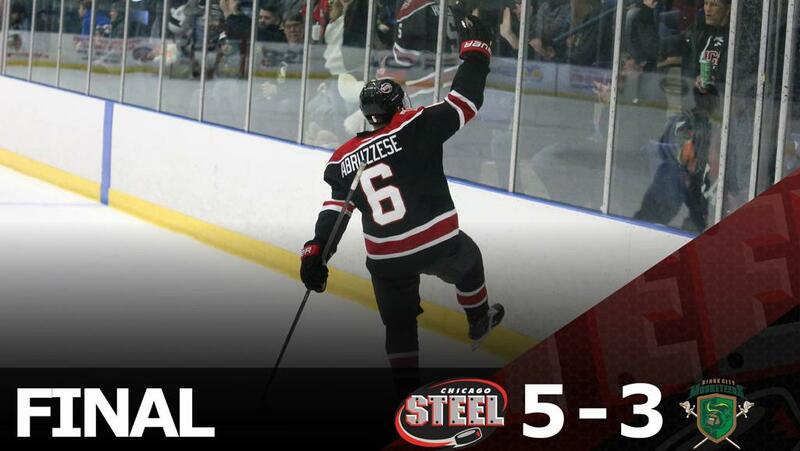 Steel center Nick Abruzzese, who leads the USHL with 54 points (18-36-54), was credited with three assists while right wing Gunnarwolfe Fontaine scored a goal and added a pair of assists (1-2-3). The Steel registered the first two shots on net in Saturday’s game but it was all Musketeers after that in the first frame as they ended the opening period with a 9-2 shot advantage and a 2-0 lead. Sioux City forward Marcus Kallionkieli broke the scoreless tie on his team’s first shot of the game as he beat Chicago goaltender Reilly Herbst over the left shoulder on the powerplay. The Musketeers doubled their lead late in the first period as forward VIljami Nieminen finished off a slick feed in the slot from forward Albin Nilsson behind the net. Herbst then made a series of saves to keep the Steel within two early in the second period before right wing Travis Treloar got his team on the board. Treloar received a pass from center Cole Quisenberry at the blue line to set up a breakway where Treloar slipped a forehand shot as he flew to the ice past Musketeers goaltender Jake Sibell. The Musketeers once again opened up a two-goal lead when forward Kevin Lombardi scored, but Fontaine cut the lead to 3-2 just 44 seconds later. Fontaine fired home a rebound off the pads of Sibell who made the initial save of an Abruzzese shot. The goal extended both a nine-game point (8-4-12) and four-game goal (5-2-7) streak for Fontaine. Abruzzese, who used an inside-out move on a Musketeers defenseman to create his scoring chance, was credited with an assist for his third point of the weekend as Chicago went to the locker room down by one. Chicago tied the game when right wing Neil Shea scored his 11th goal of the season just 25 seconds into the third period. After Fontaine chased down a loose puck behind the net and found Abruzzese in front of the net, the puck found Shea to Sibell’s left where he pounded home the loose puck. The Steel took their first lead of the game at the halfway point of a dominant third period when right wing Josiah Slavin finished off a beautiful passing play from Abruzzese and Fontaine while on the powerplay. Slavin’s goal came as Chicago was outshooting Sioux City 8-0 in the third. Slavin found his way to the front of the net where he finished off a perfect setup pass from Abruzzese. Steel right wing Mathieu De St. Phalle sealed the win with an empty net goal to cap the strong road effort. Herbst stopped 22 shots to pick up his eighth win of the season in net. Chicago returns to Fox Valley Ice Arena next weekend to put its 13-game hoem winning streak on the line. The Steel will host first place Musketon on Friday, Feb. 15 at 7:05 p.m. on Military Appreciation/Hometown Heroes Night. The Steel then host Team USA U18 for a 7:05 p.m. faceoff on Saturday, Feb. 16 with the first 500 fans in attendance receiving a collectible Steel snow globe.